The new, creamy alternative to Oxidant 3% liquid! 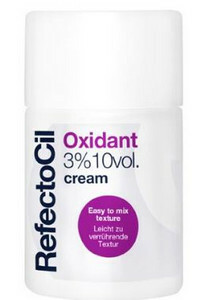 In addition to the millionfold proven developer RefectoCil Oxidant 3% liquid the new RefectoCil Oxidant 3% cream is now available, a stabilised, cream-based developer for RefectoCil eyelash and eyebrow tints. Due to its creamy consistency RefectoCil Oxidant 3% cream can conveniently be mixed with the RefectoCil tints to a homogenous paste which can be applied easily to the lashes and eyebrows. The convenient dropping device allows the drops to be dispensed precisely and economically by pressing softly on the plastic body of the bottle. Also, the dispenser guarantees that no impurities can get into the bottle. 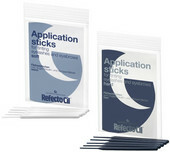 Application: Mix 15-20 drops of RefectoCil Oxidant 3% cream with 2 cm of tint into a creamy paste using the application stick. Use the paste right after mixing and follow the instructions for use of RefectoCil eyelash and eyebrow tints. Content: 100ml, sufficient for approximately 200 applications. Please read the instructions for use!